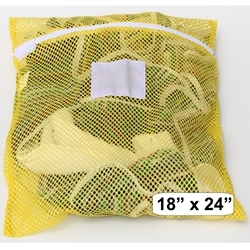 Mesh Bags 18" x 24" → Zipper Yellow Mesh Net Laundry Bags 18" x 24"
This is our Yellow Mesh Net Laundry Bag. It is made of a heavy weight yellow polyester mesh. It measures 18" x 24" with a zipper closure. All of these laundry bags come standard with an ID Patch that is used to write a person's name on the bag. A hook and loop closure covers the zipper handle to prevent it from opening in the wash. Do not exceed 158 Degrees Fahrenheit when drying. Imported. Running low on inventory. But lots of new stock coming by April 2019. Call to preorder if inventory entered is not enough.